Why walk around looking like a savage or a common soldier? 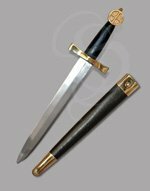 If you need to carry a dagger, why not carry one that screams, 'I have a wealth of culture, intelligence and money" (even if you don't). 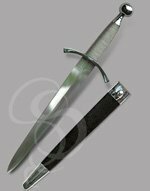 This etched dagger is stylish, compact, and looks great in the sheath or out. 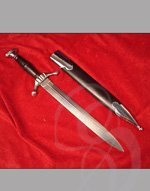 it is loosely based on a silver-hilted Germanic dagger from the high middle ages. 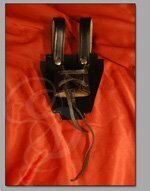 It is hand-made from High Carbon Steel (EN45). The etching on the grip is in the form of elegant V patterns, and the pommel features aristocratic scalloping lines. 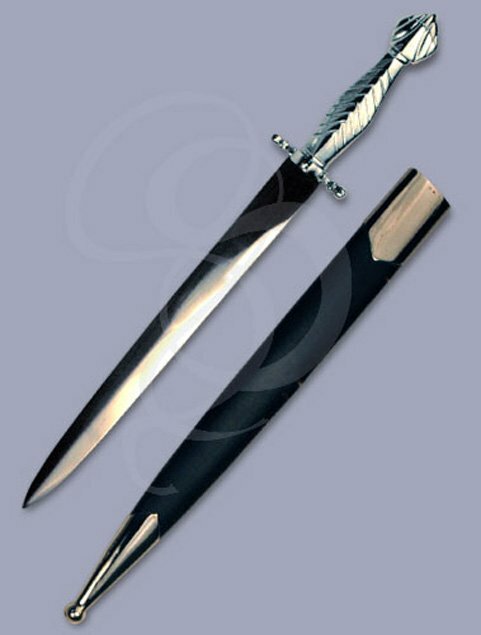 The guards on this dagger are short but strong, allowing the dagger to be worn comfortably without sacrificing strength. This is an ideal blade for anyone, male or female, who wants to add a touch of style to their costume, or anyone male, female or hemaphrodite, who wants to display a bit of history in their home. Materials: High Carbon Steel Blade (EN45). Etched nickel-plated steel grip. Leather-Wrapped Wood Sheath.